And it’s fast. I don’t think I’ve had the pleasure of seeing a more effectively streamlined Hamlet (definitely not the four-hour Branagh version I sat through at the RSC years ago!). Purists may be upset at some of the cuts, but it serves the purpose well here to do some judicious snipping. But it’s not just the cuts that drive the action – Haj allows the ensemble few moments of rest, setting a pace that doesn’t labor but flies. Too often productions of Hamlet take the view that the prince is waffling, procrastinating – here, he’s moving briskly along on his search for truth, battering at the roadblocks in his way. It’s a choice that matches the central performance by Hamilton, whose Hamlet is marked by sharp intelligence and sensitivity, not to mention some of the most natural verse-speaking I’ve heard ever on a DC stage (refreshingly, almost all of the cast has the same approach). His Hamlet has the makings of an excellent king; his tragedy is that he knows it. Here, Hamlet’s grief at his father’s death is wrenching, and he simmers with disgust at the crass way of the world. Perhaps this view is going to be a marker of our times – like another recent production with David Tennant, this sense of the prince’s loss is finally getting its due. We’re breaking free of the old Oedipal Procrastination theory, tired out from years of mimicking Laurence Olivier. Haj lets Hamilton freely flow with sadness at the beginning, but once he encounters his father’s Ghost (brilliantly and creepily underplayed by Todd Scofield) that grief fairly smolders with an almost Puritanical rage against the machine of power and lust. This boils over in the nunnery scene with Ophelia (Lindsey Wochley as a delicate adolescent) – the first time this scene has ever made me cry, Hamlet’s disillusionment at her betrayal and her inability to break free of her father’s rule is so palpable – and in a shockingly violent closet scene with Gertrude (Deborah Hazlett, all Nancy Reagan Ice Queen). No Oedipal groanings here! 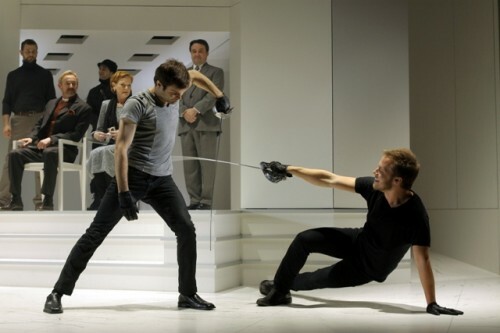 Hamlet (Graham Michael Hamilton) and Claudius (David Whalen) in "Hamlet" at Folger Theatre. Photo credit: Carol Pratt. Nowhere is Haj’s strict adherence to textual truth more evident though than in the portrayals of Claudius and Polonius. The new king clearly states to us that he murdered his brother to get the crown and his queen, and David Whalen plays him simply thus, not a tyrannical beast but a likeable man slowly driven to acts of corruption by love and ambition. It can happen to you too. As the king’s “cleaner” Polonius, so often done up as a buffoon, Stephen Patrick Martin painfully delineates the slipperly slope of becoming a sycophant to power – a role we know all too well here in Washington. There’s no vocal coach listed, so I must assume that the crystalline verse-speaking is due to director Haj as well. Almost all the ensemble adhere to a strong American English style, clearly spoken and striking enough to be mentioned. As I noticed this also with Folger’s Much Ado About Nothing, I’m wondering if this is particular to Folger and if so, it’s refreshing in its honest directness, free of unnecessary vocal flourishing – and other companies would do well to take notice. Quibbles? You know I always have a few! I was less impressed with the portrayal of Polonius’ children, who do beautifully in their early goodbye scene but fall back into conventionality later on. Just once I would love to see Ophelia’s post-nunnery monologue or mad scene be moving instead of histrionic. I won’t spoil it for you, but Haj makes one directorial choice outside the text that shocks but then goes nowhere. And I felt Justin Adams loses his way when Laertes returns, blinded by an almost distracting rage. But with both actors so grounded in the first half, I’m not sure what happened and perhaps it was just opening nerves. One of the chief joys of this production is the original musical composition by Jack Herrick, who performs onstage and provides a seamless background that’s quite haunting. Also haunting is the video design by Francesca Talenti which makes for a truly eerie play-within-the-play scene. But really, it’s the central performance that makes or breaks a production of Hamlet. Hamilton’s well up to the task, matching intelligence and sensitivity with the endurance vital to carrying us along his journey. Every era recreates this role and the play as its own mirror to the times – if this is to be our mirror, it makes me proud.